I planted 3 zucchini plants this year. My first time growing them. For weeks, I have had only male flowers and no female. Until about a week ago! I hand pollinated the flower and in a few short days, I had a beauty! One single zucchini. I decided to make zoodles. Normally, I put zucchini in smoothies, or shred them for tacos, pasta sauce, sloppy joe's, chili. But this one was special and I wanted zoodles. This dish is super quick to cook so be sure to have all ingredients prepped. Since the Zoodles and Sauce are all veggies, you can eat as much as you like. Use the appropriate number of meatballs and biscuits for your weight loss goal. Use whatever veggies you like or have for the sauce. First, we make the meatballs. Saute veggies in the olive oil until soft. Let cool. 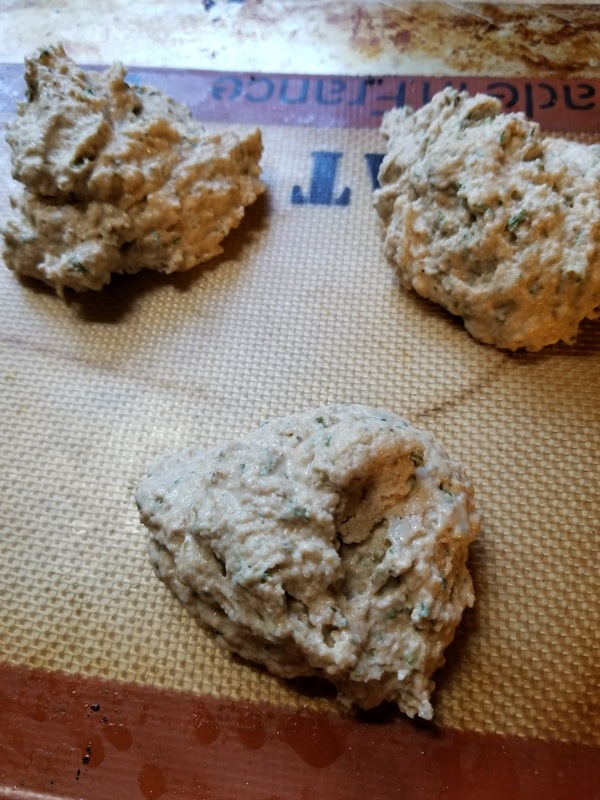 Mix with herbs, turkey, salt and pepper. 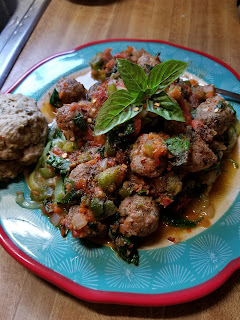 Form into meatballs (I make 32 small ones. Each is 1/2 oz of meat. Easy to portion) Place on greased baking pan or silicone mat at bake at 350 for 10 minutes. Set aside. Mix flour, xanthan gum, and herbs, salt and pepper together. Add liquid. Stir until just moistened. Add water if the batter is too thick. You want it just thick enough to hold shape. Portion into 8 equal portions on baking sheet lined with parchment or silicone mat. Bake at 425 for 10 minutes. Brush top with olive oil, if desired. 1 biscuit is standard portion. Saute onion, bell pepper and carrot in olive oil for 3-4 minutes- until just getting soft. Add garlic and salt and pepper. Saute another 2 minutes. Add tomatoes, stir and cook for 3 minutes. Add stock, spinach and herbs. Cook until spinach is wilted. 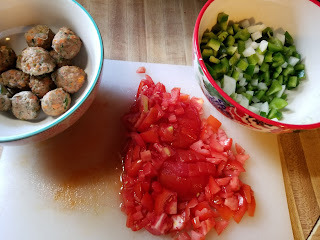 Add meatballs, stir. Keep warm on low heat. 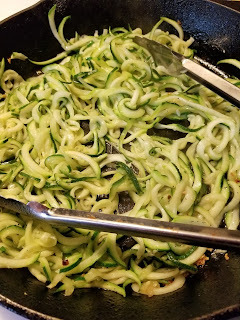 Using a spirilizer, cut the zucchini into zoodles. Place into colander and sprinkle with salt. Toss. 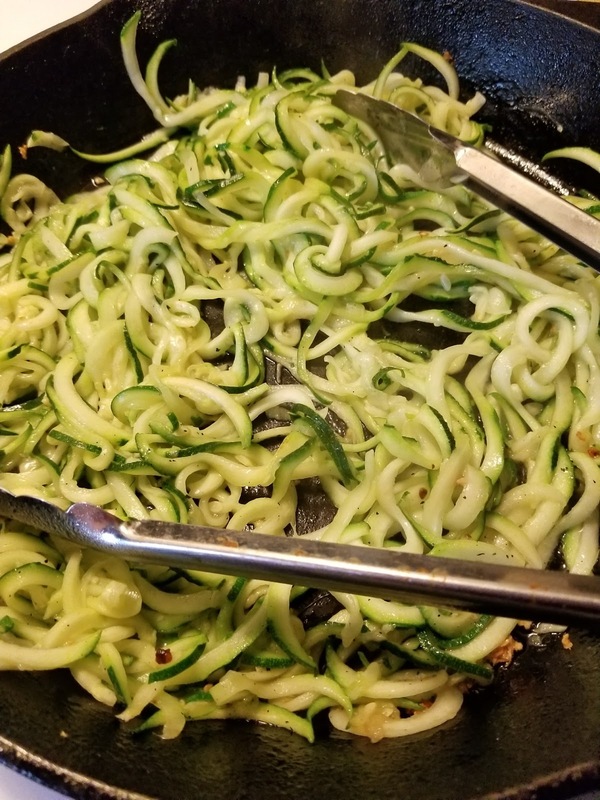 Let zoodles drain for 5-10 minutes. In a hot pan, add oil and zucchini. Saute for 1 minute, stirring around. Add garlic and saute another 1-2 minutes. Serve immediately with the sauce and meatballs. awesome sauce! didn't have meat defrosted so I made a vegetarian meal by omitting the meatballs and adding pine nuts. I also didn't make the biscuits but took your bread and added garlic and thyme. So good.